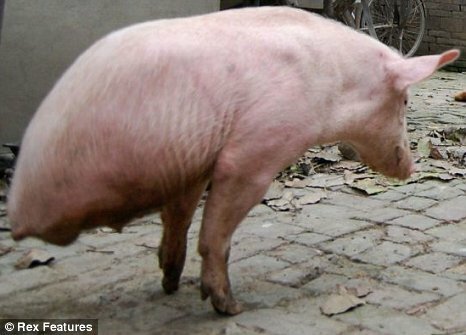 Check out this two-legged pig doing a hand stand – or should that be a ham-stand! This 10-month old pig lives in a Chinese village. She was born with only two legs but rather than kill her at birth her owner deceid to keep her and train her to walk. “My wife asked me to dump it but I refused as it’s a life. I thought I should give it a chance to survive and unexpectedly it survived healthy” says Wang Xihai the pih’s owner. ‘I trained her for a while each day. After 30 days she can now walk upside down quite well’, stated Wang. 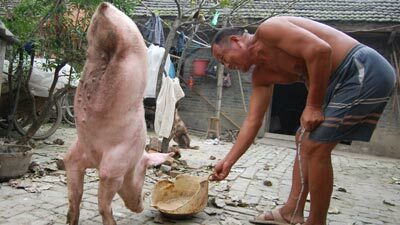 Wang says now his village is besieged by visitors everyday coming to see the wonder pig, and he is very proud. ‘I won’t sell it no matter how much the offer is,’ Wang said. If you like cool photos then check out some really nice ones here..